On September 11 four planes were hijacked. Three hit their target. One did not. Based on the shocking true events of 9/11, UNITED 93 is a powerful and provocative drama honouring the memory of the 40 passengers and crew on United Airlines Flight 93, the fourth hijacked plane on the 11th September 2001. As the hijackers pilot the doomed flight to their target, the passengers stand as one and find the courage to fight back. Unfolding in real time and charting the explosive clash of modern day and old world, UNITED 93 weaves a gripping story from the standpoint of the passengers, crew, flight controllers and military that will live in your memory forever. We are going to cut all the unnecessary fluff for this review and tell this straightforwardly: We hope everyone in this world would go and watch this film. Making a movie about the unforgettable September 11th attacks may not be the most politically-correct move to some, but English director Paul Greengrass (The Theory of Flight, The Bourne Supremacy) tackles the sensitive issue with such realism and skills, it makes this picture a must-watch. The film tells the story of the fourth plane which was hijacked on the fateful day when the world saw evil’s ugliest face. While the other three planes crashed into World Trade Center and The Pentagon, United 93 never reached its target, thanks to the courage of the 40 passengers on board. The story is approached with intense grittiness, and it is definitely not easy to watch. Right from the start of this 110-minute movie, everything seems to be chaotic and frenzied. It is only apt of Greengrass to maintain this mood throughout because it is only then, that we understand how the system was made vulnerable in a real-life situation like this. The movie wastes no time in explaining all the technical jargons and terms used in the air control centers. It may frustrate some viewers, but we thought this would be a more realistic depiction of the chaos that happened that day. You will also see no big stars or familiar faces here. And it works because it further draws you into the realism of the movie, how these people are actually people around us, with everyday details weaved into every one of them. Unlike Oliver Stone’s World Trade Center which was released later, this movie does away with all the sentiments and mushiness which the topic of terrorism can really do without. The movie achieves this with its unsettling camera work by Barry Ackroyd (Just A Kiss, The Wind That Shakes The Barley) and a disturbingly effective score by John Powell (X Men: The Last Stand, Happy Feet). The result is an engaging movie which keeps your eyes glued to the screen despite the discomforting images you are seeing. What ultimately makes this movie work is the message behind it. Of course, some may feel that it celebrates The Great American Spirit, but at the same time, if you think about it carefully, it is actually the courageous human spirit that this movie is reflecting upon. There is attempt to bring out the confusion and tension felt by the terrorists, but it is a subtle one. This is certainly not an entertaining movie, given its disturbing content and images (hence its M18 rating), but it is absolutely an important one. Someone has to tell the story of United 93 sooner or later, and we are glad it is told this way. 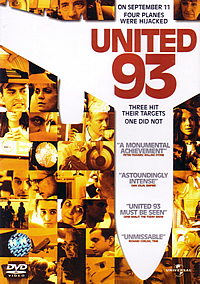 The last 30 minutes of the movie are extremely difficult to watch, as it focuses on the final moments of United 93. But as the last heart-thumping moments are presented in vividness before you, you might just feel a lump in your throat. To understand the movie better, the producer of this DVD gives us some really insightful extra features to make the affecting viewing experience more complete. United 93: The Families and the Film – In this 60-minute documentary, we see how actors who play the victims on United 93 meeting their real-life counterparts’ families. At first, we thought we couldn’t sit through 15 minutes of this painful viewing experience, but it turned out that there is still much hope and optimism in these Americans yet. Also, the segment brings us to a private screening for these people, where heartfelt emotions and support for the movie are felt in full force. Commentary by director Paul Greengrass – Never have we heard such an intuitive commentary on any disc. Greengrass tells us how real air traffic controllers, stewardesses and army officials were cast to make his movie more realistic. He also shares his views on how systemic control can fail us, as seen during the September 11th incidents. In the last few scenes of the movie, we thought we heard Greengrass choking on his tears because of the powerful images on screen. .
Memorial Pages – Page after page of pictures, bio-data and write-ups about the victims of United 93 are also included in this Code 3 disc. Written by their families and loved ones, you can feel the sincerity and commemorative spirit of this small gesture. The visual transfer will bring you an unforgettable viewing experience where shaky and trembling camerawork elevates the intensity of the film. The audio quality on the disc accentuates Powell’s heavy timpani usage in his music score, and you can also choose between English, Japanese or Thai Digital Dolby 5.1.